Just over a year ago, Sunnyside Church decided to join in with the North American Division’s “Let’s Move Day.” The nearly 4-year-old program is designed to encourage healthy living and combat childhood obesity. 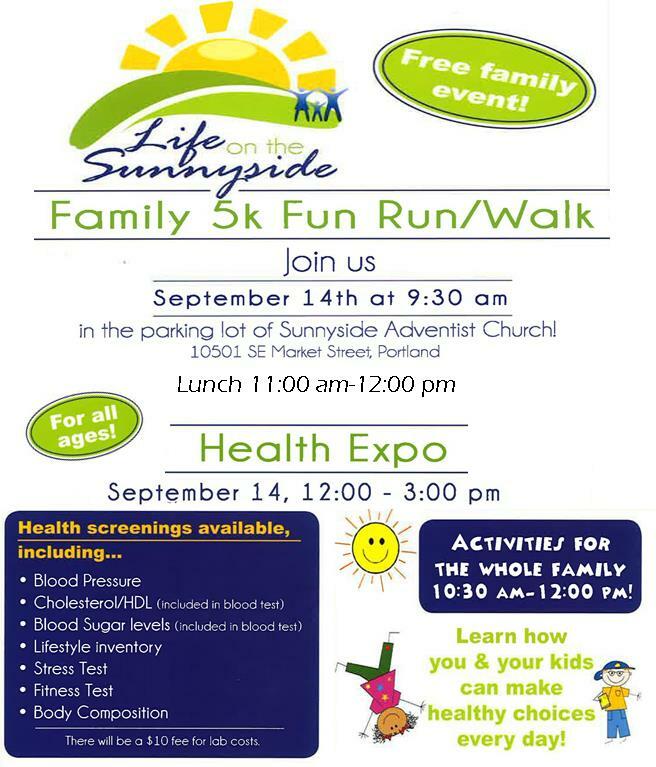 Last year, a fantastic team organized the “Life on the Sunnyside Family Fun 5k” and Health Expo. The event was a resounding success, with over 80 registered participants and scores of volunteers. In fact, it was so successful that it comes back for an encore performance this weekend on Sunday morning. The race numbers are ready, the finisher medals are prepared, a team of people will be ready to set up shelters and outline the course. But there’s still one missing ingredient: You. Why does Sunnyside put on community events such the Family Fun 5K, concerts, or VBS? First, it’s to use the resources that God has given us to inspire our community toward a better way of life. Second, it’s to build meaningful connections with the people of our community. Here’s the thing: People don’t build connections with events or programs. People build connections with people. That’s why we need you. We already have event coordinators and volunteers. Those are the people that are “supposed to” be there. But it’s the dozens of friendly Sunnysiders who participate in this event that will set it apart. That’s why we need you. Each of you who read this are the pulse and the lifeblood of Sunnyside. You are the people that make a difference in anything we attempt to do together. So I hope that you’ll carve out an hour or two of your Sunday morning and participate in the Family Fun 5k. I hope that once you arrive, you’ll attempt to meet someone you haven’t met before. (It’s not that hard. Make eye contact. Smile. Say, “Hi, I’m <your name here>!” You’re off and running.) I hope that you will choose to be the connection in this event. And who knows? You might even make a friend. Don’t think you can walk 5 kilometers? Come anyway! The course is laid out so that you can do anything from 0-5 K easily . Don’t let that be an excuse. If you’re willing to participate, Sign Up Here! As always, thanks for doing your part to make Sunnyside a fantastic community in which to live and worship. A vase is missing. On August 23, there was a lovely bouquet of flowers on the table at the North door (near the back parking lot). If you know where the vase might be, please contact the office, 503-252-8080, or just return it to the office. Thank you. September 14-28: ABC’s Open House Sale. Download the sale flyer at abcflyer.com for all the details.